Do you have some more pictures of the floor you think might need replacing? From the little bit that can be seen it doesn't look too bad. Hey Terry even as inexperienced as I am I'm sure I can save the floor but it may not be perfect. The main problem area is the Bermuda triangle and the battery section will need a bit of work as well. Under the first rib there is exposed metal as I removed a bad repair job from a past owner, the ribs appear to be complete apart from one little section. Rotisserie looks great, much flasher than mine when I made it, but it worked. You will sort out any issues as they arise, from what I see it'll work a treat. As long as it doesn't break I'm happy haha. I would wait until after the blast has discovered more holes before deciding to replace the floor, but looking at what you have got there now I would just repair near to the first rib on each side and leave the majority of the floor which appears straight there. Replacing the whole floor might be closer to 'perfect' but they never quite look very original. I guess ill wait and see how it turns out after the sandblasting has been done. Im still not 100% happy with the base of the main column of the rotisserie, I might go back and add extra bracing. I have to make a decision on what rust protection paint to use now. Por15, Xtroll rust conqueror, KBS etc. Is there a good go to primer/rust preventive paint that can be finished well and cover some of the blemishes/dimples. Im also looking into the possibly of rhino lining for the undercarriage, possibly even the internal floor? for the underside and inside the tub I use either a Wurth's or 3M Stoneguard which can be painted over if you like and is thick enough to hide the the little imperfections. Well I haven't got as much done as I would like but I'm getting there slowly. I uncovered the production/model number stampings under the seat and it matches the plate and shroud so that's a good sign. Unfortunately they painted over the original sticker with the colour code so I cant determine the exact colour, does someone have a suggestion for removing the paint without damaging the sticker? Can anyone tell me what this colour is? From what I can tell its jade green or empire green. In regards to the floor it can definitely be saved I just need to buy some 1.6mm steel sheet and start patching up the small sections until I can figure out if I'm going to build a bender or pay someone else to do the bends for the Bermuda triangle. I'm not 100% on the lower part of the heel board though. It may be easier and more accurate to replace that piece. I can't see any signs of either Empire or Jade Green but it looks like a Crystal White, but what year is the Moke to narrow it down. The location of the sticker, i.e. not on the radiator shroud, suggests that it is not the paint sticker but probably the one that mentions brake fluid or coolant or something else. Its been painted over a couple of times, the last colour done was white but underneath it is definitely a light green colour, I assumed the sticker was for colour. The year model is a 1970, the green you see is over the original metal and was sprayed with white over that at some point. The first two pictures show the light green I am talking about. it still looks off white to me, but lets pretend it is green in which case neither is Empire which is very dark and Jade which came in around 1977 and is very bright and Hairy Lime which is early to mid 70's which is again a very bright tone. 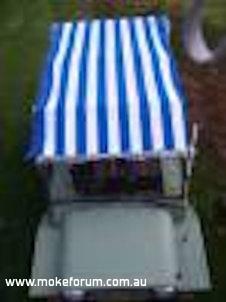 What you have got doesn't look like a green I have seen on a Moke, but more a 60's Austin or Morris pale green. I'm really curious to know what it is now haha. I suppose its just one of those things I will never find out without the sticker. I was hoping to paint it the original colour. Maybe the pictures are bad but up close without glare from the light it looks light green. Ill try find a spot with a better sample for future reference if I end up trying to match the original colour. Since its definitely not Empire or Jade I will have to keep looking. Not a great photo - just a copy of Tony's avatar - but maybe gives some idea. Not much to report just spent a bit of time stripping the paint and rust, I also fabricated an attachment for the engine stand. I'm hoping to at least pull it apart and see what I have to work with this week sometime. I had the head off and everything seems to be in worse shape than I thought it would be. I'm starting to think I may need to outsource the engine as its beyond my currently ability. This is my first project and I'm already a little overwhelmed with the work that needs doing on the body.Right now I'm just hoping the transmission is usable. 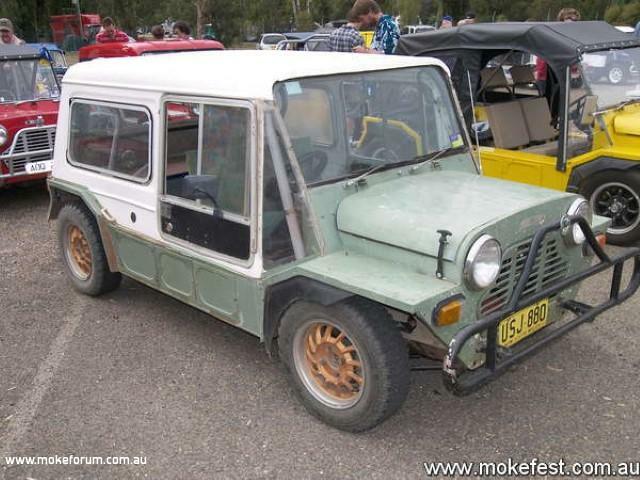 Not really sure how to proceed, once the new year is in I will be back at work and wont have as much time to work on the Moke. Can anyone suggest a good/reasonable engine builder in Sydney, I hear Russell from Russell engineering is good but not sure of his prices. At this stage if I can get a decent running engine in the 2k range I will be pretty happy. Fortunately I bought 2 spare heads off someone and they are in much better shape then the one I have on the engine.